1999/4 Fundação da organização "Tsutamaru"
1999/4 Fundación de organización "Tsutamaru"
Apr 1999 "Tsutamaru" was established. 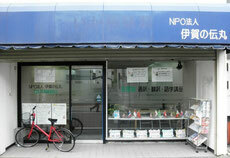 An office was opened on Shintenchi Dori street in Iga city. We developed our interpretation and translation business. Apr 2005 Registered as an incorporated NPO. A new office was opened in Ueno Higashimachi in Iga city. Ask Tsutamaru about interpretation and translation!